Typhoon Rumbia, the eighteenth typhoon of the year, and fourth to affect East China in less than 30 days is forecasted to make landfall between August 16 and 17, local China time. Approximately 50,000 people have been evacuated from China’s Zhejiang Province ahead of the storm. 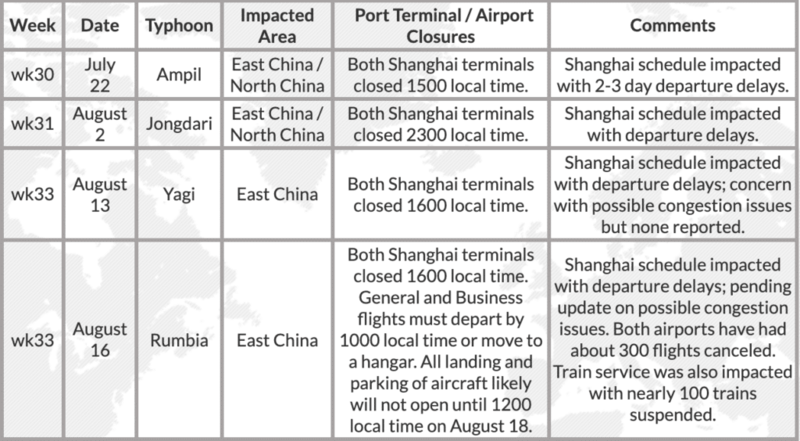 Typhoon Rumbia, like the previous three typhoons in recent weeks, will impact the ocean ports of Shanghai and Ningbo, airports at Shanghai-Pudong and Shanghai-Hongqiao, as well as others in the region. As with previous storms, airports and ocean terminals will close until the storm passes. This will affect the sailing and flight schedules and lead to possible delays. The typhoons are adding to the strain on an already tense market experiencing an early and strong peak season, driven by ocean carrier capacity reductions and the U.S./China trade tensions. The following is a breakdown by week of the typhoons, with the most recent typhoon expected to make landfall on August 17. MIQ will continue to monitor any service delays and/or routing changes that can impact transit times and provide updates as they are available.